There was a rumor, right after Trump was elected, that circulated among the White House staff. According to this rumor, Trump told a staff member he "better like reality TV," because that's the way things were going to be with him as president. He was right. A mixture of reality TV and an open assault against democracy have been getting him "yuge" ratings with his base. The majority of the nation, and the world, thinks he's a narcissistic nut looking for applause in all the wrong places. His open desire to be like the strong men, aka dictators, that he worships, is deeply embarrassing coming from a US president. During the whole North Korea dog and pony show in the last month or so, it looked like Trump might arrange a peace summit in Singapore. To the casual observer. At one point Trump was fantasizing about how great the summit would be if it were held on the border between the two countries. He talked about the party that could be held afterward as if the whole problem - stretching back for over four decades - could be solved in one hurried meeting. It would be the pinnacle of Trump's wheeling and dealing career. That he even thought it was a realistic negotiation shows how naïve he can be. That certain Trump supporters starting talking about a Nobel Peace Prize for Trump BEFORE the meeting even took place is not surprising. They've bought into Trump's alternate reality. 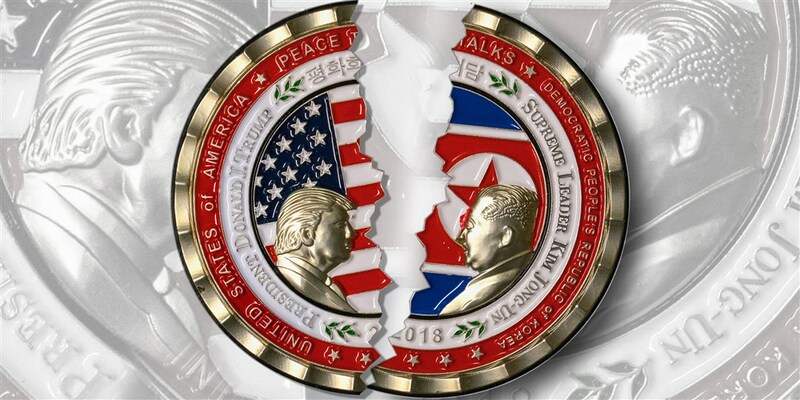 I wonder what's going to happen to all those gold coins that Trump had minted to commemorate his great accomplishment, with his and Kim's faces on them? Taxpayers paid for that piece of vanity. Trump, to his dismay, is finding out that being the president in real time isn't anything like his reality TV personality, where he could get away with saying anything without any repercussions.